You are trapped into a large building and there are gears mounted on the wall that can help you perform actions through various obstacles while grabbing the stars for points and eventually get to the target area to end the level. Press W, A, S, D buttons for running and jumping and use the mouse click to shoot a cable to a gear and hang around while finding a way for further steps. 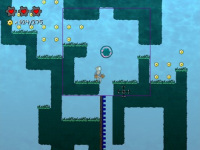 In total there are eighteen levels consisting of the classic, normal, and expert levels. Fight against the whole clone penguin army.